● Member survey ideas & activities, volunteers, etc. ● Motion to adjourn the meeting. Seminar materials will be posted under the “Seminars” menu. Our dynamic hobby and your Radio License offer opportunities to build, explore, experiment and discover. 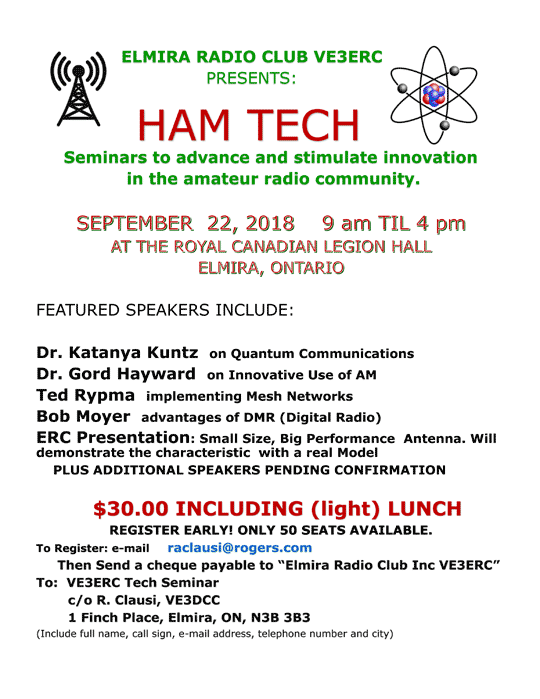 As part of our club’s effort to facilitate curiosity and, perhaps, innovation, we are sponsoring a “Ham Happening”— Saturday Tech Seminars dedicated to learning outside of the box. We will have 4 or 5 speakers address issues of interest in back-to-back one-hour plenary sessions, inclusive of questions. There will be a modest “funeral-style” lunch at noon. The day will begin at 9:00 am and end at approximately 4:00 pm. -Robert Moyer, ve3NXT, licensee for our local Digital repeater will explore several aspects of DMR(digital mobile radio). Additional speakers are yet to confirm. STEP 2: Print a copy of the form that you emailed, above. ** Be sure to INCLUDE the printed copy of the form you emailed to us in STEP 1. Your name is on the final list when the cheque is received and processed. STEP 3: We will confirm via email that your name is on the attendance list when your cheque is cashed. More details will be provided with the confirmation. STEP 4: Arrive at 8:30 am, on site, on Saturday Sept. 22, 2018 to pick up your registration package, name tag and meal ticket. Enjoy!!!!! ● Club Equipment & Resources Inventory ● Other ? NOTE: Please bring with you a written list of all Club equipment & resources/material in your possession as we are compiling a Club Inventory. As noted in the previous training announcement, if you don’t see specific instructions on how to RSVP at the session you are interested in, please RSVP to me at geoff.coulson@canada.ca.